I have looked around the Internet several times for something that looks like a piece of software equivalent to Microsoft Visio, able to run on Ubuntu. ASCII drawing just dont work for me..
My current programming project is called "Webinspect". 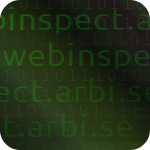 A web based tool for safe analysis of web sites that you would prefer a second opinion on before visiting. No matter whats on that site, you wont get exposed to harmful or malicious content as trojans, worms, rouge antivirus, or profane movies or pictures. Information security is a hot topic, and there are plenty of reasons for that. This post will focus on the hows and whys of keeping it safe at home.